Mason Archie is a self-trained artist who has not been troubled by these disruptions. He began painting when he was 14 years old and experimented with oils. Within a year, the emerging artist had become so proficient he was hired by Lamar Outdoor Advertising Company to paint billboards. During his almost 15-years with Lamar he painted everything from cars, ice cubes, liquors, cigarettes, celebrity portraits and mirrored lakes. At about age 30, Archie formed his own commercial sign company. Archie has turned to fine art production full-time. 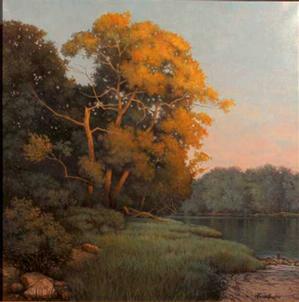 He characterizes his work as encompassing Hudson River School technique with an Impressionist palate. Archie honed his artistic methods through self-study of Old Master styles and credits the trompe l’oeil works of artist Ken Davies as his first inspiration to paint. Archie’s landscape paintings are in private corporate collections such as Nationwide Insurance, Eli Lilly and Wells Fargo Bank. 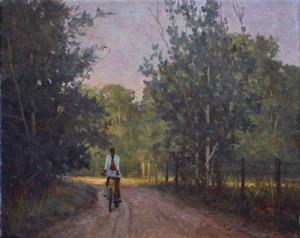 He resides in Indianapolis, Indiana and exhibits nationally. Viewing his work provides an opportunity to ponder the meaning of beauty in human consciousness and life as well as in the art itself. In Evening on White River, one’s eye lingers on sprouts of wild grass, craggy rock and rippling pool in the foreground, with the eye then drawn to a spectacle of brilliant light emblazoning a majestic tree, then moving out across glassine waters and a river bend to softly colored Romantic atmosphere. 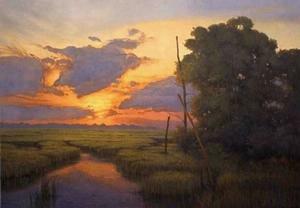 In Sunset across the Marshland, a play of sun and cloud above the serenity of the marshes. 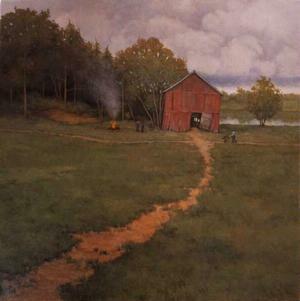 The decaying structure and the scar of meandering paths in Old Red Barn recall the beauty of the ‘picturesque’ as categorized by Burke and the little fire in the distance is the consumate touch! 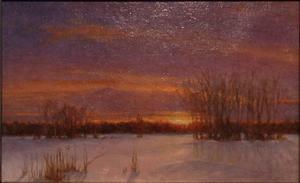 Looking into Sunset Across the Snow, the viewer is positioned in a glowing snow field to contemplate the beauty of horizon and sky. Here Archie employs a palette and sensibility reminiscent of the great Romantic painter Casper David Freidrich. And in each of these works, he succeeds in suspending our reality, perhaps, achieving what Kant extolled as one’s direct, personal and unmediated response to beauty. Awakening to the space on my side of the frame, I must return to my charge to consider how these contemporary works, unabashedly traditional in form and purpose, might be considered when set within contemporary artistic approaches and aesthetic theories that have derided beauty and its purposes so vehemently? Why make work today that is traditionally ‘beautiful’ when edgy, hip, cool, high and low minded conceptualism still rules the day among contemporary art? In this meditation on "beauty," there are three aesthetic views worth consideration: First, there is the eighteenth century view of Immanuel Kant, alluded to earlier, which holds that the perception of beauty is unmediated by cultural influences. He maintains that each individual perceives beauty as a direct and personal response to art or nature. This Kantian view provides the foundations for twentieth century aesthetic critics such as Roger Fry, and later Clement Greenberg, who engaged formalist interpretations of art that maintain, “…disinterested apprehension of directly perceivable properties (color, rhythm, meter, balance, proportion, etc.) distinguished aesthetic experiences from all others…” 3 In opposition to the formalist approach to art, a second view of beauty and art, also prevalent throughout the twentieth century, maintained that the perception of beauty is socially inscribed. Many contemporary aesthetic critics and art historians subscribe to this second view of culturally inscribed perception and castigate beauty in its traditional Western forms as being misogynist, colonialist, and imperialist among other ills. Among those subscribing to this second view, “ …Avant-gardism, both in the early twentieth-century avant-garde movements…and the neo-avant-garde such as Minimalism and Conceptualism, recast beauty as ideologically complicit with political power, while simultaneously cultivating a sensitivity to the repressed values of ugliness, philistinism, shock or abjection…” 4 The theoretical foundations for this approach to art and interpretation are found largely in the work of figures such as Smith, Hume, Hegel, Marx, Freud, Nietzsche, Ricoeur and Foucault 5. The ideas of Scarry and Songtag are useful in contemplating why an artist such as Mason Archie might engage the beautiful in art by choice or intuition, and why viewers can still derive meaningful pleasure from such beauty even if their perceptions are ‘mediated’ by society. Scarry maintains in spite of the politics which surround beauty in aesthetic debates and approaches, humans will never be able to achieve remove from the thing itself in art or life. In our current moment as perceivers of beauty, we might hope that works representing nature, such as those here by Archie, arrest self-centeredness and reconnect us to a more comprehensive, even cosmological sense of fairness and protection for all. While never far removed from the many dubious agendas and ill-purposes for which beauty can be employed, philosophical claims for beauty such as those by Scarry and Sontag help us to justify our pleasure in it and a desire for its continued production. 1.Dave Beech, ed., Documents of Contemporary Art. (London & Cambridge, MA., Whitechapel Gallery & M.I.T. Press, 2009). 2. See, Immanuel Kant, “Critique of Judgment”, (1790). Edmund Burke, “A Philosophical Enquiry into the Origin of Our Ideas of the Sublime and Beautiful”, (1757). 3. Marcia Muelder Eaton, “Kantian and Contextual Beauty”, The Journal of Aesthetics and Art Criticism, Vol. 57, No. 1 (Winter, 1999), pp. 11-15. 6. See, Arthur C. Danto, “The Abuse of Beauty”, Daedalus, Vol. 131, No. 4, Fall 2002, pp.35-56. Laurie Fendrich, “Dave Hickey’s Politics of Beauty”, The Chronicle of Higher Education, January 2, 1013. Elaine Scarry. On Beauty and Being Just (Princeton , New Jersey: Princton University Press, 1999). Susan Sontag, “An Argument about Beauty”, Daedalus, Vol. 134, No. 4, (Fall 2005), pp. 208-213. 7. See Scarry (Beech edited volume), p. 42. 9. Susan Sontag, “An Argument about Beauty”, Daedalus, Vol. 134, No. 4, (Fall 2005), pp. 208-213.